We all get to hear the term debt trap quite often, but what exactly do we understand by a debt trap? We all get to hear the term debt trap quite often, but what exactly do we understand by a debt trap? Debt trap could actually have two definitions. One approach to a debt trap could be when your total debt levels are such that they hamper your credit standing in the lending market. The second approach to a debt trap is when your current inflows are insufficient to service the interest and principal on your loans. 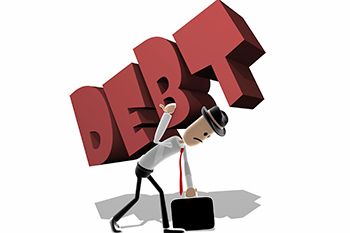 The problem is that you do not realize you are in a debt trap till the time you are neck deep in it. Assuming that you do get into a debt trap, what is the way out? Actually, all is not lost! As the graphic below captures, you can still come out of a debt trap with a little bit of discipline and negotiation skills. The problem with the above approach is that it is therapeutic rather than prophylactic. That means; the approach is curing the problem rather than the preventing the problem in advance. Let us focus on how to avoid falling into a debt trap in the first place. There are many occasions when we enjoy intermittent cash flows. It could be a year-end bonus from your employer, it could be windfall capital gains on a stock you recently bought or it was some wonderful aunt who left a share of property in your ancestral village. What do you do when you get these intermittent cash flows? More often than not, it is spent on purchasing the latest LED TV or the swanky new I-Phone in the market. A better way would be to use such cash flows to repay your high-cost loans. Your credit card costs you 35% per annum and your personal loan costs you 16% per annum. When you repay these loans you are effectively earning that much on your money. That is surely a better deal! Your bank gives you a very enticing sales pitch that you can revolve your credit card outstanding by paying just 5% of the amount. Don’t fall for that trap. Each month you are charged 3% interest, which means you effectively reduce your loan by only 2% each month. Worse still; if you miss even a single credit card payment then there is penal interest plus a late fee plus GST on all these charges. You normally slip into a debt trap when you become lax in dealing with your overdue EMIs and credit card debt. That is best avoided! Quite often we get into a debt trap because we splurge on conspicuous consumption. You do need to celebrate and pamper yourself occasionally but that cannot be at the cost of your financial stability. Eating out twice a month is understandable but eating out thrice a week is not only a drag on your credit card but also worsens your body mass index (BMI). You will be surprised how much you can save on your shopping bills if you try to get the best online discounts. Over a longer period of time, they can make a huge difference to your monthly budget and actually save you from falling into a debt trap. You keep picking loans because the sales rep offers it to you. Over a period of time, you end up with a large number of loans with different maturities. A good way to reduce your loan burden will be to consolidate all these loans into a single loan with slightly longer maturity. You may have a longer EMI tenure but your cash flows are better managed for now. Also don’t be hesitant to negotiate on interest rates and service charges. Almost every charge in the financial world is absolutely negotiable if you have the ability to persist. This is slightly more complicated. We often take loans against our property or our equity shareholding. If the prices of these assets fall below a certain threshold, then the bank asks you to bring in an additional margin. That is where the problem comes as you end up either losing the asset or paying margins you cannot afford. Ideally, borrow as much as you require and not as much as you are eligible to borrow. That is the golden rule! This is an internal discipline that most of us should set when we have debt. For example, your total debt can be 2 times your assets if it includes your home loan. Otherwise, it should not be more than 1.5 times. Similarly, your sum of all EMIs should not be more than 50% of your take-home salary. This discipline is the best way to avoid a debt trap.